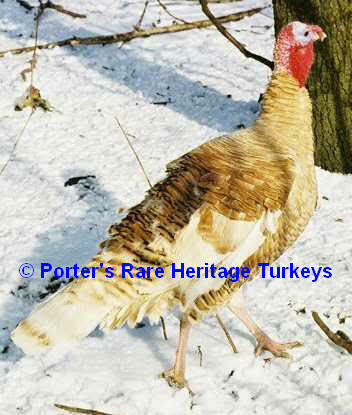 Red Palm turkeys are very rare, they have a palm-like pattern in a light red version. 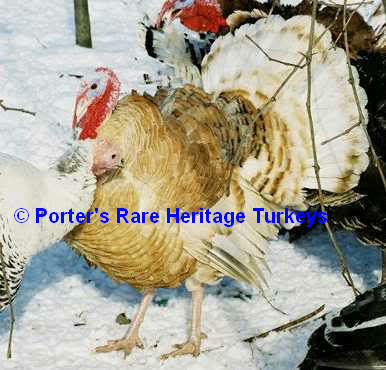 Toms can have some black edging on the tips of their feathers. Genotype is: b1b1cgcgngngrr for toms and b1b1cgcgng-rr for hens. Black winged bronze base with the addition of palm,narragansett and red genes. 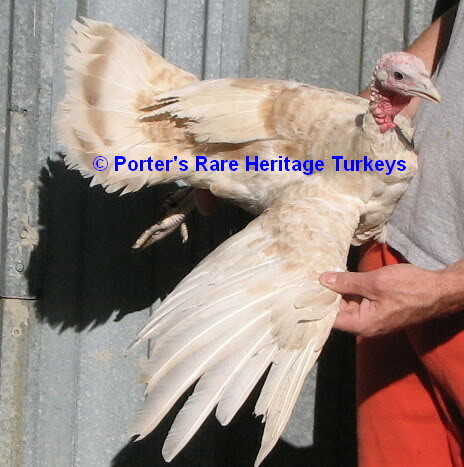 Since they are homozygous they do breed 100% true to this color/pattern. Red Palms are more of a "washed out"red because the Narragansett factor tends to lighten, fade or remove reddish brown pigment, but without it the homozygous recessive red tends to overcome or cover up most of the palm pattern. The pattern never seems to be as distinct in markings as on the black pigmented Royal Palm. They tend to be a more pastel like pinkish red. The poults appear solid white without any markings when hatched. Also, red pigment tends to be deposited at a later stage. By 3-4 weeks of age some reddish colored feathers will start to appear.